Sense V-Jet Sub-ohm Tank Atomizer is a sub-ohm tank which is conveniently slide to fill and can hold a maximum of 4.5ml of your favorite e-juice. The V-Jet Sub-Ohm Tank adopts the V-Jet Coil Family and includes a 0.4 ohm coil head and a 0.6 ohm coil head. Sense V-Jet Sub-ohm Tank Atomizer is a sub-ohm tank which is conveniently slide to fill and can hold a maximum of 4.5ml of your favorite e-juice. The V-Jet Sub-Ohm Tank adopts the V-Jet Coil Family and includes a 0.4 ohm coil head and a 0.6 ohm coil head. Both the coil heads are vertical coil and rated for 40 to 100W. 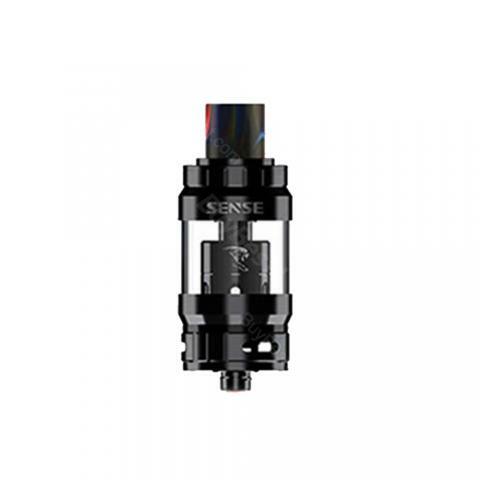 The V-Jet Sub-Ohm Tank also features dual adjustable bottom airflow which is fully closeable, a juice flow control system, and a proprietary 10mm bore resin mesh drip tip. • You also can buy replacement coils in BuyBest. Good cloud production of this V-Jet+ Subohm Tank, it's lucky that I ordered compatible replacements at the same time. Sense V-Jet+ ist nicht teuer, ist unkompliziert, sieht dazu ansehnlich aus und vorallem ist sie klein.